Ophelia: There’s rosemary; that’s for remembrance. Pray you, love, remember. And there is pansies; that’s for thoughts. Laertes: A document in madness – thoughts and remembrance fitted! Ophelia: There’s fennel for you, and columbines. There’s rue for you, and here’s some for me. We may call it herb of grace o’ Sundays. You may wear your rue with a difference. There’s a daisy. I would give you some violets, but they withered all when my father died. They say ‘a made a good end. “A document of madness…” Laertes claims, but surely, as we know from Shakespeare’s tendency to call upon objects with a rich cultural history, there is no folly in what Ophelia is suggesting by presenting these flowers. 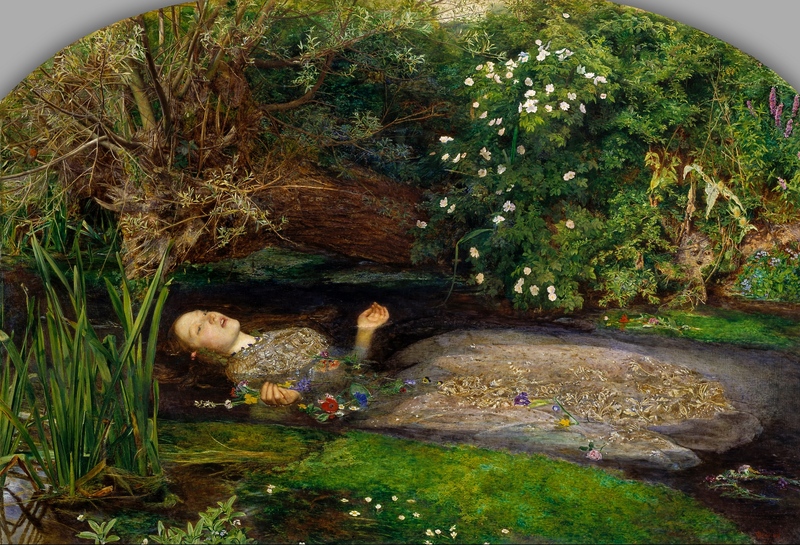 As a reader, we are under the impression that the flowers must be embedded in some deeper context that allows Ophelia to look at them as symbols of larger ideas (such as remembrance, and thoughts). And indeed they are; in order to understand why Ophelia is looking at these specific objects as vehicles for a more significant message, it is necessary to look at each plant and its historical uses. Rosemary – Was first used by the Greeks and Romans as an aid of protection against evil spirits. Students in ancient Greece wore garlands of rosemary around their necks, or braided it into their hair to improve their memory during exams. Others would place it in their pillow the night before to enhance memory during sleep. When it was brought to Europe it was regarded as a purifying and healing herb, but it’s usefulness for retaining memory was also reiterated in the English court. Sir Thomas More (1478-1535) wrote, “As for rosmarine, I lette it runne all over my garden walls, not onlie because my bees love it, but because it is the herb sacred to remembrance, and, therefore to friendship . . .” In addition to Hamlet, Shakespeare also makes the use of rosemary as an allegorical symbol in Romeo & Juliet (Friar Lawrence requests that mourners bestow Juliet with rosemary at her burial, as dedication to her memory). Pansies– The flower’s name is derivative of the French pensee, meaning thought, reflecting the flower’s reputation for bringing thoughts of loved ones. Shakespeare also cited the meaning of the flower when, in A Midsummer Night’s Dream, he wrote that the sleeping Titania will fall in love with the first creature she will see when she will awake, thanks to the pansy juice on her eyes; “the juice of it, on sleeping eyelids laid, will make a man or woman madly dote upon the next live creature that it sees.”. fennel flower – The fennel flower looks very different from the wild fennel plant and the fennel root (both of which can be eaten and used in home remedies). Fennel – Fennel is one of nine Anglo-Saxon herbs known for secret powers; a bunch of fennel hung over a cottage door was said to prevent the effects of witchcraft. Greek and Roman women nibbled on fennel seeds because they believed the herb suppressed the appetite. Ancient Egyptians believed eating the fennel herb and seeds imparted courage, strength, and conveyed longevity. The columbine flower comes in a large variety of colors with differing petal shapes…it’s hard to believe they’re all the same species! Columbines – The symbolism of the columbine flower is varied, and often quite confusing. It was once believed that this flower was a symbol for foolishness, at the same time, however, it was considered a symbol of fidelity and holiness. Today, though, these flowers are given as gifts to represent its more modern meanings of seduction and anxious excitement. These flowers make very uncommon but beautiful and meaningful gifts, and are sometimes given as potted plants or simple, single-cut flowers. rue flower – The rue flower differs from the rue plant; at one time the holy water was sprinkled from bushes made of rue at the ceremony usually preceding the Sunday celebration of High Mass, for which reason it is supposed it was named the “Herb of Repentance” and the “Herb of Grace”. Rue –In the Middle Ages and later, it was considered – in many parts of Europe – a powerful defense against witches, and was used in many spells. At one time the holy water was sprinkled from bushes made of rue at the ceremony usually preceding the Sunday celebration of High Mass, for which reason it is supposed it was named the “Herb of Repentance” and the “Herb of Grace”. Daisy – The Celtics connected daisies with innocence. They believed that daisies came from the spirits of babies who had died during the birthing process. The daisy flowers grew in order to lighten their parents’ grief. Daisies have their place in Christianity. One legend has it that the daisy grew from the Virgin Mary’s tears. In fact, daisies are sometimes used to symbolize Christ and the Virgin Mary. You will also see the daisy as a motif in artwork from the medieval period as a symbol of Christ’s innocence when Christ was a child. Another Christian legend describes how the wise men were looking for a sign of where the newborn Christ was located. When they saw groups of daisies near a stable, the wise men knew they had found Jesus as the daisies looked like the star that had led them to Bethlehem. Violet – In Christian symbolism, the violet stood for the virtue of humility, and several legends tell of violets springing up on the graves of virgins and saints. European folktales associate violets with death and mourning. In the language of flowers, it has had various symbolic meanings. Its color may indicate the love of truth or, conversely, the truth of love. In keeping with the latter, it is said that unknown persons who had secretly admired or loved him decorated the tomb of the Roman tyrant Nero in the spring with violets. As I began to do research about each of these specific plants, I started thinking about the phenomenon of the flower as an object. Firstly, it is important to recognize that flowers are meant to die. In many ways they are similar to human beings; they are given life by preexisting organisms (germination and seeding), their growth depends on the environment they are brought up in, and their life span is generally short. Looking at those facts alone, it is interesting that Ophelia in her “madness” chooses to draw similarities between the life of these flowers and the lives of the people around her. Stepping outside of Hamlet and looking into the historical/mythological associations of these plants has helped me understand the important influence that religion had on Shakespeare’s work (and most other artistic creations of that time). When Shakespeare began writing plays for the group called Lord Chamberlain’s Men in 1594, Queen Elizabeth I had already dealt with England’s fierce schism over Protestantism and Catholicism. As Queen, she wanted to appease a large majority of the English population who had converted to Protestantism when her father, Henry VIII, had implemented the Protestant Reformation in 1532; however Elizabeth herself still clung to symbols of the Catholic faith such as the crucifix. Although most of the religious upheaval had been settled by the time Elizabeth died in 1603, Shakespeare lived another 13 years under the rule (and patronage) of King James VI, who is remembered primarily for his campaign against witchcraft. James became obsessed with stopping the threat posed by witches, and in 1597 wrote the piece Daemonologie, which is suspected to be the main source of background context for Shakespeare’s Tragedy of Macbeth. In looking at all of this research simultaneously, it is fascinating to see how close Shakespeare was to the religious figureheads of his time, and in retrospect, notice the religious influence on the implicit meaning of the objects presented in Hamlet. One small example that I found absolutely fascinating is to look at the way Ophelia describes the daisy in comparison to the rest of the flowers; “There’s a daisy.” When I first read it, I wondered why the daisy was undeserving of any more explanation. But upon doing research on the mythological associations of the flower, and learning that in the Christian faith, some believed daisies marked the path that the wise men followed to find Christ in Bethlehem, it made sense that Ophelia simply stated “there it is”. It’s as if the daisy, in this context, could be representative of that traditional story, or it could be an indication from Ophelia that the daisy is representative of guidance. “Ophelia”, Sir John Everett Millais, 1851-52. This painting is held in the Tate Britain Gallery in London. It depicts Ophelia singing before she drowns in the river in Denmark. The work was not widely regarded when first exhibited at the Royal Academy, but has since come to be admired for its beauty and its accurate depiction of a natural landscape. Many more connections could be made when looking at the deeper symbolism of the objects in Hamlet, but this specific section painted a full circle connection in my own head, so I thought I’d share! When thinking about objects in Shakespeare’s Hamlet one particular scene comes to mind. Yorick’s skull, which originally appears in Act 5 Scene 1, turned into the iconic symbol of the tragedy as a whole. Hamlet is usually seen on DVD covers, book covers and performance posters in the iconic kneeling position as he holds up the skull. This skull turns into more than human bones for the Prince of Denmark. While Hamlet holds the skull he begins to examine how the jester’s life no longer has any meaning because it no longer exists. He then takes it a step farther and discusses how no ones life has more meaning or importance than anyone else’s because all human beings end up as this skull. He emphasizes this when he asks Horatio: “Dost thou think Alexander looked o’ this fashion i’ the earth?” (Shakespeare 5.144). Here, Hamlet realizes that all people, noble or not, return to these “base uses” and become nothing more than dust and clay. In comparing the life of Alexander the Great with the songs and jokes of court jester, Hamlet diminishes both to meaningless human lives that both culminate in death. The realization that death comes to all humans seems to definitively prove to the prince that not one human life matters. At this moment the skull serves as something like a catalyst for Hamlet’s actions. Once he realizes that death is a universal truth for all of humankind, Hamlet easily disregards the idea of an afterlife. This overwhelming realization seems to prove to him that every human’s soul, regardless of actions or social status, will end up as meaningless dust. With this in mind, Hamlet can finally take up his task without any thought towards the preservation of his own spiritual sanctity. Yorick’s skull ultimately changes Hamlet’s entire way of thinking. The question of “To be or not be” no longer matters because whatever answer he may choose, his life will always end with his body being committed to the earth. Shakespeare then emphasizes this idea that life itself is meaningless for Hamlet by following the scene with the skull immediately with Ophelia’s funeral. As the procession of nobles move past Hamlet and the bones of the court jester it solidifies the idea that no amount of noble blood, good deeds or forgiveness of sins can save them from turning into dust and dirt. Yorick’s skull reveals this truth to both Hamlet and the audience as the same time. In Shakespeare’s time, the Black Death was devastating the population of Europe and bodies were littering the streets of London. With this scene, Shakespeare clearly illustrates to the nobles and the groundlings that they will all meet the same end. In a way, this scene unites the social classes of Elizabethan England behind the message that all human life ends in the same way and is, therefore, meaningless. On a personal note, Shakespeare lost his only son to the Plague, which may have inspired this depressing outlook on life and his emphasis on death in this particular tragedy. Yorick’s skull not only serves as a catalyst for Hamlet and the action of the play, but it also negates the famous question of being by emphasizing the expansive meaninglessness of life. Shakespeare uses Hamlet to examine the meaning of life in an unconventional way. This iconic object proves to both the protagonist and the author that life has no meaning because it all leads to the same place: a grave. Trying to keep up with my great-grandparents as they jump from El Salvador to Guatemala to France to Spain has left me a little winded, not to mention more than a little envious. As I look out my kitchen window I can see teensy little snowflakes falling, triggering, yet again, a longing for warmer climes. In an effort to keep myself from spending all my savings on an impulse trip to San Sebastian, I have decided to remind myself about the things I like about my own life. So, this week’s post will not feature the ticket or the de Jaureguis, but, if it is any consolation, it will feature Arnold Schwarzenegger (sort of). For the last two year, my longtime boyfriend and I have shared a small studio apartment at Southside Terrace Apartments. It is a plain space, much the same as any other apartment in the complex. The walls are painted the same shade of dubious light beige, the bathroom has a small medicine cabinet with mirrored sliding doors mounted to the wall, and the carpet is a knobbly beige just a little darker than the walls. In addition, it has a large bookcase which serves as a barrier between the kitchen and the living room/bedroom. The backside is towards the kitchen, creating a sort of half wall where I have chosen to hang our joint calendar listing important dates such as birthdays, our anniversary, and, less romantically, when the electric bill is due. The front of the bookcase faces the living room/bedroom. It is divided into six cubbies (each roughly two and half feet wide and a foot and half tall) accommodating some of our favorite belongings. Although this bookcase is not unique (all of the deluxe studios here at Southside have them), it is the most fascinating aspect of the apartment and it is the chief feature in evoking the sense of this apartment as a home. More specifically, I would argue that it is the primary feature that evokes the sense that this apartment is our home. The kitchen side of the bookcase. The joint date calendar is to the left. 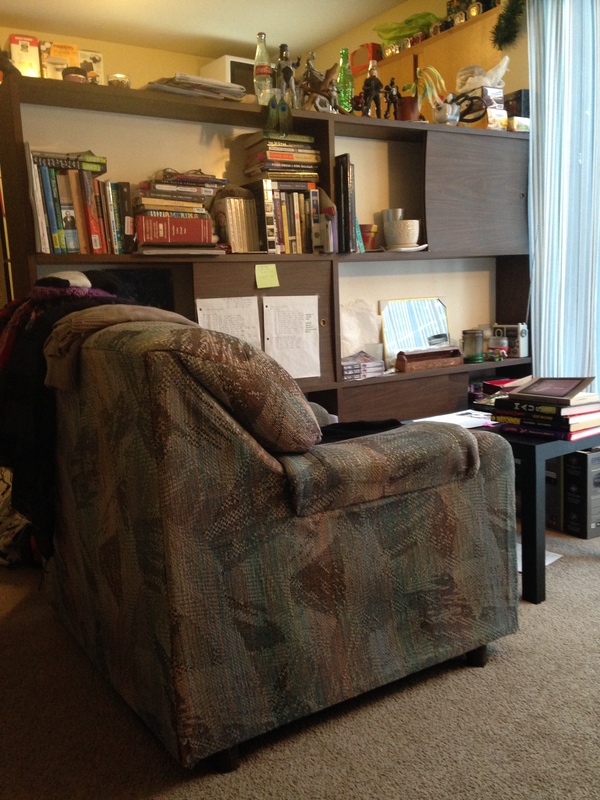 The bookcase serves as a miniature habitus, reflecting both my and my boyfriend’s identities. In this space, our individual collections have blended together in ways that indicate both our common interest and our differences. 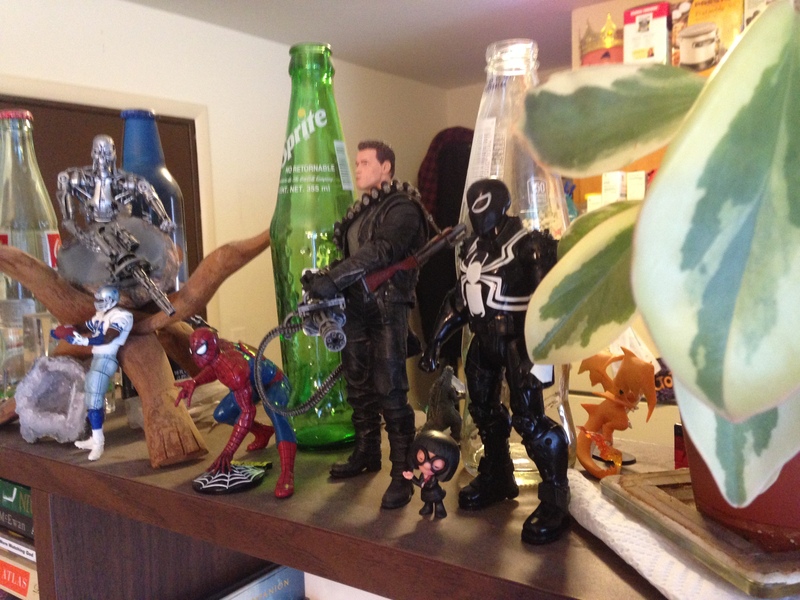 For instance, posing along the top of the book case are several plastic figures of various heights. A few of them are characters from our favorite action movies. 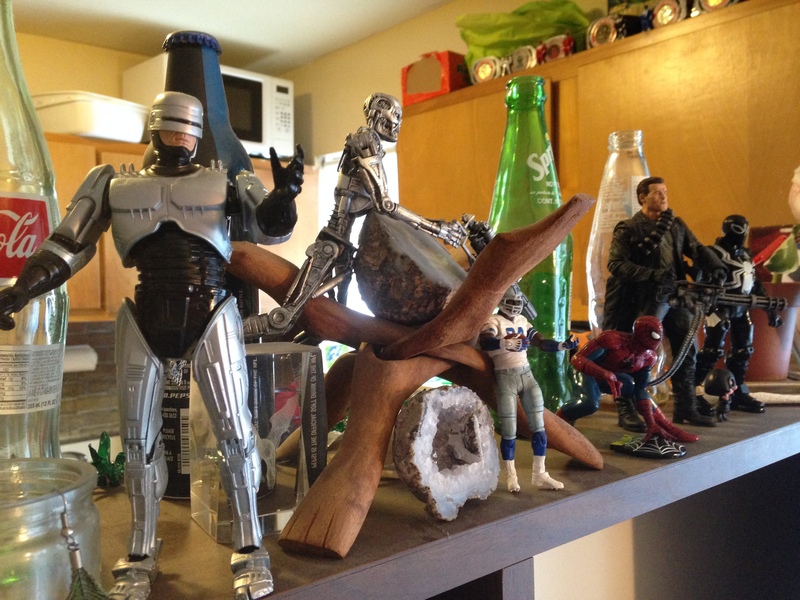 Robocop stands as if trying to placate a suspect, his gun still contained (for now) within his metal leg. The stripped down Terminator crawls over a wooden stand, seemingly off to destroy his other self who stands a little ways down with a Gatling gun. However, overtime the collection has grown to reflect more of Matt’s other interest. Spiderman now crouches, ready to swing away, while his former nemesis Venom keeps watch next to my houseplant. A miniature Cowboy (of the Dallas football team variety) stands ready to receive the ball, unaware that he is going to be the skeleton Terminator’s first victim. On the kitchen side, a tiny red Power Ranger stands next to Godzilla the size of a finger. Godzilla, in turn, seems to be pointedly facing away from the similarly sized, but more brightly colored, Charizard Pokémon figure. Almost all of the figures are posed in a way that suggests a story (e.g. the crawling skeleton Terminator off to fight his fully skinned self). Viewing this collection, a stranger can fairly easily divine my boyfriend’s favorite football team, the television shows he watched as a child, and some of his favorite movie as well as his earnest appreciation for merchandise associated with his interests. However, they might also note his exuberance and creativity. Not unlike Charles Ephrussi and the netsuke, Matt wants the figurines to be shared and appreciated, not kept in boxes in the closet.They are a clear indicator of his presence in the apartment, mixing unselfconsciously with the decorative wooden stand, the geodes, and the houseplant. The bookcase is also the clearest indicator of my presence in the apartment. The three cubbies on the right contain most my books (I have many and was forced to leave some at my parent’s house). It is a blend of past textbooks, childhood favorites, and current interests. The textbooks (almost all having to do with literature and language) are certain to give me away as an English student while the rest of my collection will reveal a penchant for science fiction and contemporary literature. I have not categorized them in any ostensible way (The Chronicles of Narnia sit next to the brain-teasing metafiction novel House of Leaves on the top shelf. David Mitchell’s Ghostwritten is not next to Cloud Atlas, but down next to my dictionary and anthology on literary criticism on the middle shelf), and if someone were to glance at them they would probably conclude that I am not very organized. While this is a little bit true, the books do, in fact, have a method behind their madness. The ones that I refer to the most often occupy the top and middle shelves while those that I refer to less often are located on the bottom. I call this organizational scheme the Arm Chair System as the texts I need the most are within easy reach from the armchair located, conveniently, right next to the shelves. 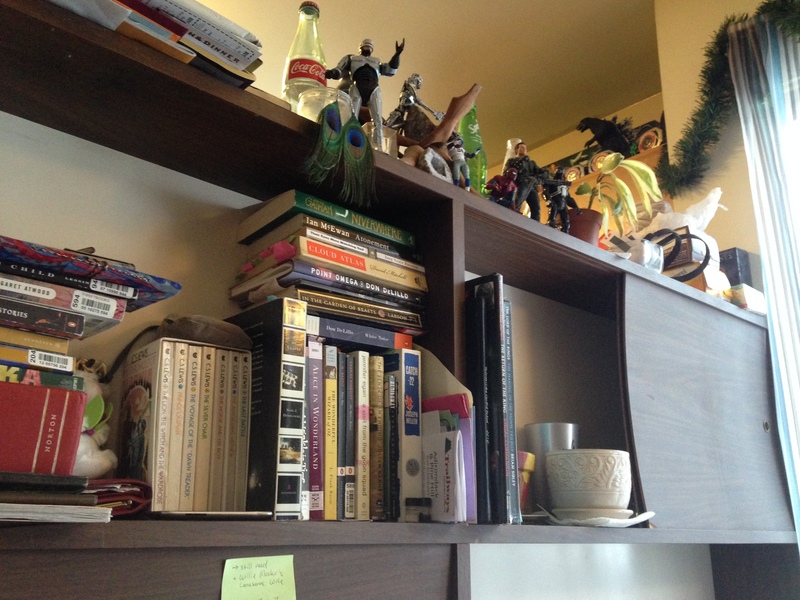 The middle right shelf also hosts my various notebooks, sticky notes, and a pen holder that holds a plethora of ballpoint pens and wooden pencils as well as a couple of highlighters (yellow). It is difficult for me to guess what someone might think of me looking at my books. Likely, my love of language and narrative will be clear. Perhaps they might guess at my appreciation for the fantastic and the unexpected, and my desire to push on and find new forms and make new connections. Perhaps, they would get nothing of the sort. I am too close to see myself. Everything you need at arms length…accept the fridge. The Chronicles of Narnia box set is right above the green sticky note. Next to it is House of Leaves. Cloud Atlas (orange and beige spine) is stacked horizontally. Together, the various items on the bookcase represent Matthew and me both as individuals and as a couple in ways that are far more complicated than I can fully explain here. One can clearly see our mutual love of storytelling and our tendency to collect stories in tangible forms. Yet, one might notice that, spatially, the two collections are quite clearly separated. No figures descend to the shelves, and no book ascends to the top. This is partially a height problem. I cannot reach my books if they are sitting on top of the bookcase. However, it is also a product of the unspoken agreement that the right cubbies are my space. Due to the apartment’s small size, this boundary is relatively significant as it denotes one of the few areas either of us have allowed ourselves personal space. By the same token, I respect Matt’s wish that all of the figures be displayed, regardless of whether or not they match my aesthetic impulses (Full disclosure: Spiderman is not my favorite Marvel superhero). Our mutual acceptance of not only each other’s needs for space, but also our need to shape this space to reflect our likes regardless if they are our partner’s like, have made it possible for us to live in such a small space without turning Terminator. The fact that both the collection are present is the reason why the bookcase equals home.When the figurines are gone and the books packed away, you will know that Elise Bruce and Matthew Grey do not live here anymore. I not sure if I should write about my roommate, especially since we’ve know each other for so long. I know much more about her background than Daniel Miller did about the residents in London, and it’s hard not to have that information dominate my observations, especially when I feel like it bears importance. For one, I know that 99% of things she would call her possessions are in our room right now. I, on the other hand, have a room at home that still looks inhabited even when both my sister and I have left for college. There are books on almost every flat surface on her side of our dorm room. There are also books in her drawers, and two boxes filled with books under her desk. In the past she has told me that she treasures her books, and I know she once got very offended when her sister mishandled them. I also know that she struggled with reading up into the forth grade, so though it might not be a direct outward statement, her books may represent her overcoming this struggle. A lot of her books have a historical theme, for she is both passionate about history and a history major. She bought the book Poems on Evening and Night – that I wrote about in my last post – in Boston. She said she saw the inscription and had to have it. The book, Poems, does not sit out on display with her favorites, but is nonetheless part of her collection of books that help her express her passion for, and keep track of, her knowledge of history. It sits among her larger “collection” of personal things; her clothes, her Gone With the Wind and van Gogh posters, her Harry Potter wands, and her tiramisu bowl. It sits in the room she calls home because it is place she feels at home. It’s a book she hasn’t really read but keeps anyway. I think the fact that the book has a history associated with WWII had an added appeal to her because her mother is passionate about Jewish history and has passed on this passion to her. I see her mother in her choice of decoration, which I think could be seen both as an effort to comply and cooperate with her tastes. Her books, though some have been gifts, are free from this relationship, and I think most have been acquired by my roommate herself. Aesthetically pleasing, they can hide behind their covers from judgment and do as they please, a sort of freedom I know she desires. I posted a picture of where I keep my voodoll in my room last week, but I will show it to you all again and further explain it’s habitus this week. The doll sits on top of a bookshelf in my bedroom in New Paltz. Surrounded by an array of all sorts of objects, it seems like more of disarray than anything, but I think I would describe it as organized clutter, because my collection of objects is quite purposeful. As previously mentioned, I live right near the rail trail. I can actually see people walking by on it outside of my kitchen window. Since I’ve dyed my hair pink, I’ve been calling myself a woodland fairy. A woodland fairy would have to inhabit some sort of enchanted forest, am I right? My bedroom is very forest-inspired, and the little collection that sits on top of my bookshelf is only a glimpse at it. 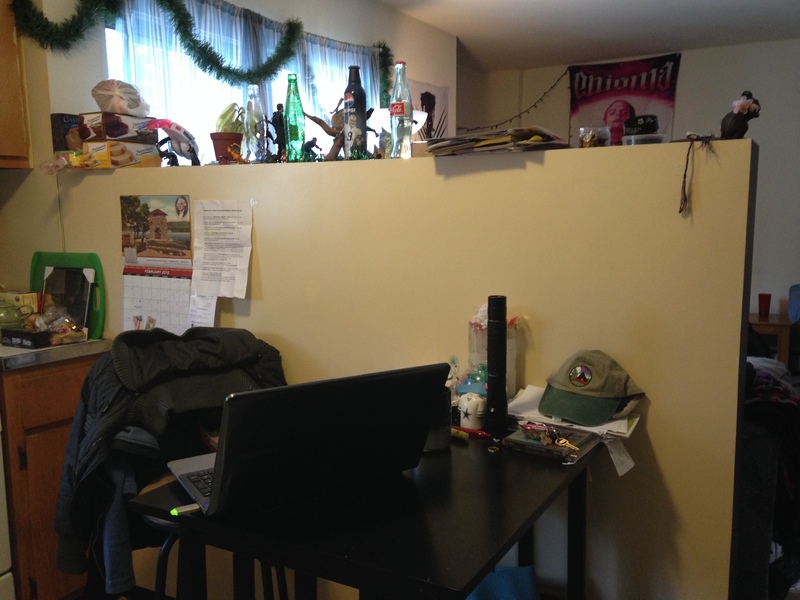 The pinecones at the very left edge of the shelf are ones I picked up along the walk back home one day after class in the fall. When I had found them, they were still sticky with sap. I had wanted to pick up even more than four at the time, but did not have a bag to put them in and already felt silly with the few that I had. I’ve been meaning to hang them up as wall decor, but I have decided I like looking at them just resting on the top of the shelf. The bottles sitting behind them are drinks that I’ve purchased at different food vendors around town and decided to keep because I’m a sucker for great packaging design and re-purposing glass bottles. The largest one currently is acting as a piggy bank. The skull further adds to the magic of my room. It is plastic and I’ve gotten a lot of remarks about probably liking Hamlet for having a skull just laying around. I really just like it because I’m a fan of all things macabre. The five candles including three small handmade soy candles, a large Yankee candle, and a candle in an owl shaped holder make me feel like I’m casting a spell every time I light them, especially since if I wanted to actually use the voodoo doll I would need to light them in order to use it’s magic. The leather dog coin purse was a gift from a dear friend, and I hold my laundry money in it, keeping it in plain sight so I remember to take it with me as I leave to do that chore but also because the purse is adorable and dogs are my favorite. Scattered beneath everything are patches and buttons that I have yet to put on my backpacks/purses/jackets/etc. I have made most of these buttons and have been given the patches. 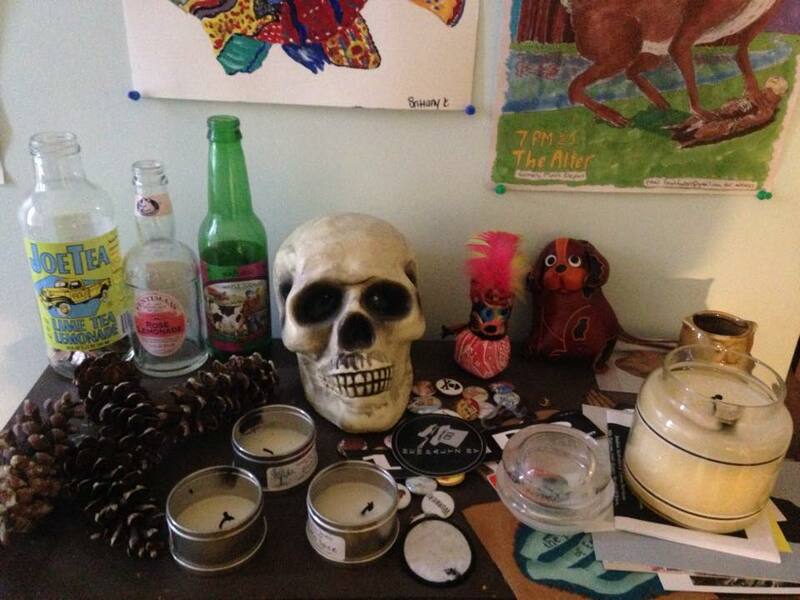 This glimpse of my bedroom, where the voodoo doll rests, says a lot about me and I’m not even showing you all the rest of my room (just yet, anyway – maybe one day!). Sorry this post is a bit late! I had a lot of trouble posting it for some reason. I thought it was a bit ironic that I was assigned Portrait 8 for this week. I’ve been fascinated with the concept of body art since I started building on my initial ear piercing around the age of fourteen. Like Charlotte, I can strongly identify with the way tattoos become a part of you, and with the desire to turn one’s best memories–the ones you want to hold onto always–into permanent, irreversible marks. 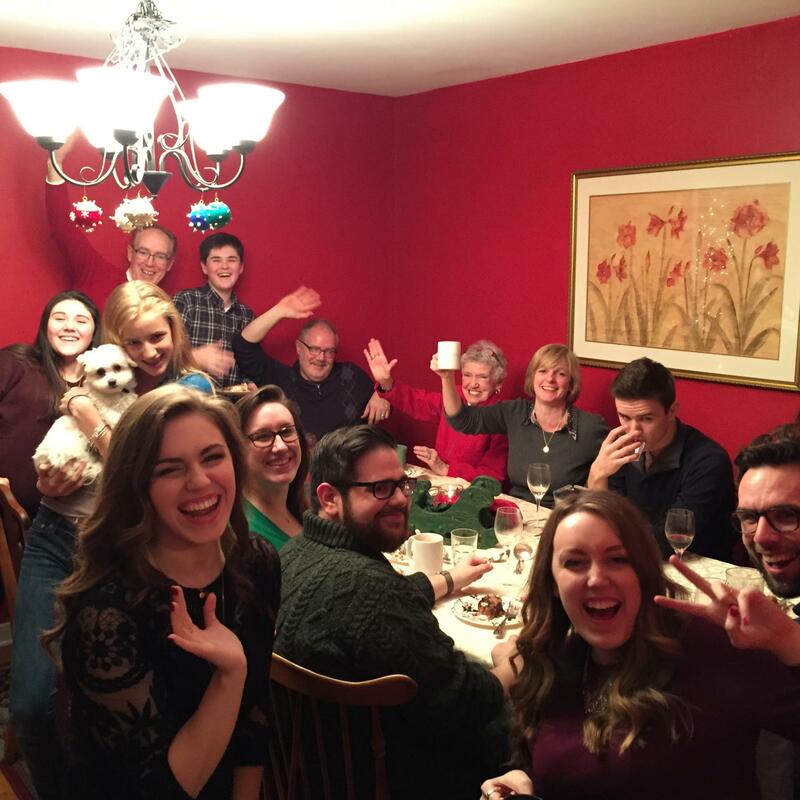 Unlike Charlotte, I come from a family that doesn’t feel the same way about such things. When I pitched the idea of getting a tattoo for my eighteenth birthday, the answer from both my parents was a resounding “no.” They voiced the same concerns that Miller cites in his chapter, mainly, the fact that they will change drastically as your body does. And so, I am left to show the meaning of things in much less permanent and personal ways. Like Charlotte’s collection of earrings that she was forced to remove, my grandmother’s necklace lives in a little felt box on top of the stereo speaker in my bedroom. I mentioned before that I don’t wear it very much. I did a lot of thinking about that after writing the post, and I realized that it probably stays there because I don’t think about my grandmother all that often. I was very young when I knew her, and was young when she died. I never had the opportunity to form a relationship with her beyond annual Christmas visits, so on some level, it’s understandable. Of course, the reverse is also true–because we don’t have photographs of her (or anyone, really) up in my room or anywhere else in our house, I tend not to think very much about relatives I rarely see. My own bedroom–crammed to the nooks with things I’m currently using and thinking about but sporting very little in the way of memories–has become a reflection of the way I think primarily in the moment. My grandmother’s necklace, in its little box alongside a handful of other trinkets, is almost a physical symbol of my fleeting moments of remembrance, and its absence a symbol of my own thoughtlessness in the midst of a busy life. Like Charlotte’s photograph of her lover, it’s become a memory-turned-artifact. Of course, that’s not to say that my mind would change if my connection to my grandmother consisted of more than just jewelry. I like to think that I’d give more thought to distant relatives and past memories if I had more permanent and outwardly visible reminders around me–pictures, knickknacks, photograph albums, or perhaps a meaningful piece of body art like Charlotte’s tattoo. On some level, I think it would. My mother recently has begun clearing things out of our house, and I’ve been searching through years’ worth of uncovered materials in hopes of finding some family photographs to put up in my room. From an anthropological standpoint, I feel like there’s been a trend toward collecting memories nowadays–be it a family history, heirloom, or story–so I think people like Charlotte, who mark their own bodies with memories, and others who collect and display memorabilia, are on some level beginning to make the world into one very large habitus, comprised of the unique artifacts and memories of individuals. I notice that when I am nervous I tend to take in my surroundings. I focus on the details of the room rather than why I am triggered to feel anxious. It may function as some sort of escape or it may be biological. When we take stock of our environment we are learning. We are noticing, observing, and consciously or unconsciously thinking about it. I am forming a hypothesis about biological needs and actions in the modern world; my need to study my environments stems from a biological need to feel safe. I do not know if other people do this as well. Are there times when you take in your surroundings sometimes more thoroughly and intensely than other times — for reasons similar or separate from the reasons stated above? Whatever the fundamental reason for our need to know about the place we are in, we all have to ability to begin. The inclination to learn and make educated guesses about people based on their projections of self in a certain place is a true ability we all have. As I take to you to my house — the habitus of my objects chosen for this week — tune into your own biological anthropologist. Notice if you are aware of conclusions you draw or questions you have. I live in a house off-campus. This house was decorated by college students here at SUNY New Paltz. Does this already create an image for you? Does this already start your schema and shape your senses? I believe we represent the creative expression New Paltz stands for. Our mismatch, all inclusive, yet specifically exclusive house is just one contribution to the freedom of exploration New Paltz tends to support and sustain. Mismatch because the house is put together by seven different people with seven different contributions (though some are more responsible for interior decorations than others). All inclusive because all is open… be yourself is the message to take in. Specifically exclusive because who else has pictures of Venice next to a plastic parrot? Specifically nonspecific. A bit of an oxymoron, but you’ll understand with more imagery. A lamp with a base or some type of animal horn, a light that is forever changing color, coffee bean sacks of pinned to the wall, and two giant speakers besides the television make up some of the stuff. One book case filled with kinetic sand, a lint roller, someone’s iphone charger, an empty bottle of Jack Daniels, cards, and a thunder noise-maker make more stuff. And candles, cups, and bowls haphazardly across the coffee table make up even more stuff strewn all across the living room. If you come over and sit on one of the five options of couches, chairs, rocking chair, or giant bean-bag you will have good view of the of the art in our living room. There are two works of art that I would like to talk about specifically. They are both natural landscapes painted with strong colors, deep and pensive. If you look closely at one, you see the mountain range is made out of human bodies. If you look closely at the other, you may feel as though you are walking in the woods looking as far as you possibly can. For these two pieces of artwork the environment they live in defines the experience of them. But there is something about this living room that really contributes to the meaning of the two pieces of art in focus. What is this element of experience? I think the how is important to look at. How my housemates went about decorating, how we treat the living room, how we represent what is valuable to us, how we present our home to other people… it is the whirlwind of conscientiously erratic, yet valued contribution of stuff! The two pieces of work themselves are beautiful. They have a meaning to the whole because each piece of the living room has a purpose. The tapestry, the comfortable furniture, the tree used as an umbrella holder… these objects in the living room are meant to define the space. Here in this living room, we are college students and can be free as college students. We sit to watch a movie, friends of friends talk about relationships, people laugh with other people, a comradery of shots are taken, sometimes the coffee table has been pushed back so individuals can dance to Shakira and run around in funny hats… for me it is about how people use the space. The space that has been defined by people. The people in this house clearly want to explore art and have an open space. This space is designed to have an effect on the people who jump in this space too. The nature of the journal is its closeness in proximity to the writer. Unlike the keyboard, whose unnatural clunk is never there when you need it, or the napkin which does not offer enough space for prose, the journal gives you space and access to write at a moments notice. In its nature of closeness to me it spends its time in my bedroom in the upper left side of the house I share with two other girls. While not being used I place it on one of my bookshelves beneath my mirror next to all the wonders and worlds it wishes to emulate. Sometimes, after writing in bed, it rests beneath my side table, an antique cigar cabinet inherited from a great uncle. It will sit there for days on occasion when I have little time for casual personal writing. I’ll admit that I am a bit of a mess when it comes to my room. There is not usually one place that any given object is subject to stay. Currently there is a hand held vacuum next to my journal on top of my dogs’ kennel among an array of other objects that have landed in the vicinity for the moment. 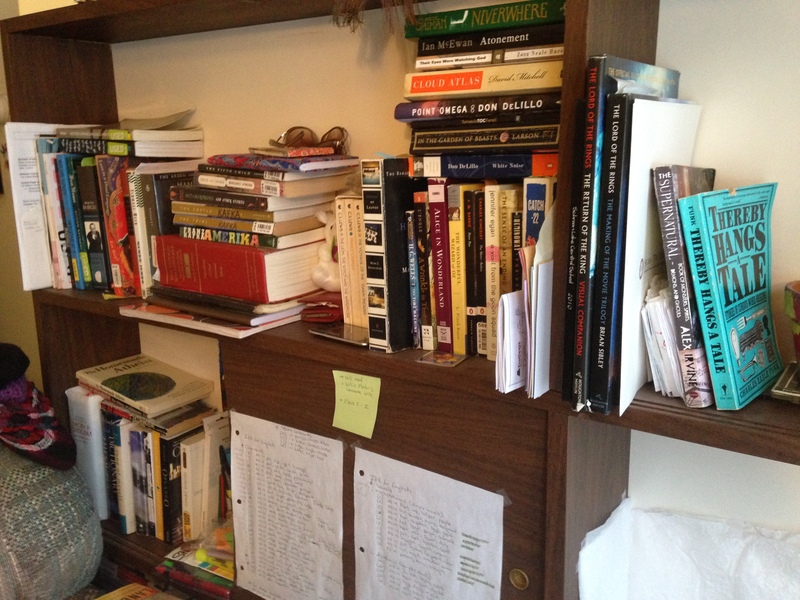 Becoming aware of this mess, I quickly move the journal back to the book shelf and the vacuum to the hall closet. My older border collie, Ruby, places a paw on my keyboard and drops a half chewed rope toy in my lap. They are as much a part of the habitus of my journal as any other object. Their hair gets caught in the pages and surprises me when I’m opening its leather cover in the backs of coffee shops. Once filled the journal will stay permanently on the shelf where the others of its kind rest. Besides these recollections are my most prized possession (besides the dogs of course), my books. They are the ones I cared to buy, gifts, and found. Each one is an old friend, or a friend I’ve yet to meet. I haven’t read all the books I own, but if I have them it’s for a reason. I remember how I came about each one and what compelled me to its pages. Some have histories that span to a time before I was born. My copies of T.S Eliot’s Collected Poems and The Shorter Poems of Robert Browning were both printed in the 1930’s. But there is no rhyme or reason to the way these books are displayed. I’ve tried to keep them orderly, but the best I’ve been able to achieve is to try and keep works by the same author in the same section. The condition of some of the soft covers reflects their use. The first book in Stephen King’s Dark Tower Series, The Gunslinger, has been chewed thoroughly and is missing both the front and back cover. I have thirty-one Stephen King books, the entirely of the G.R.R Martin’s A Song of Ice and Fire Series, most of The Wheel of Time Series (there are fourteen), and of course Harry Potter. 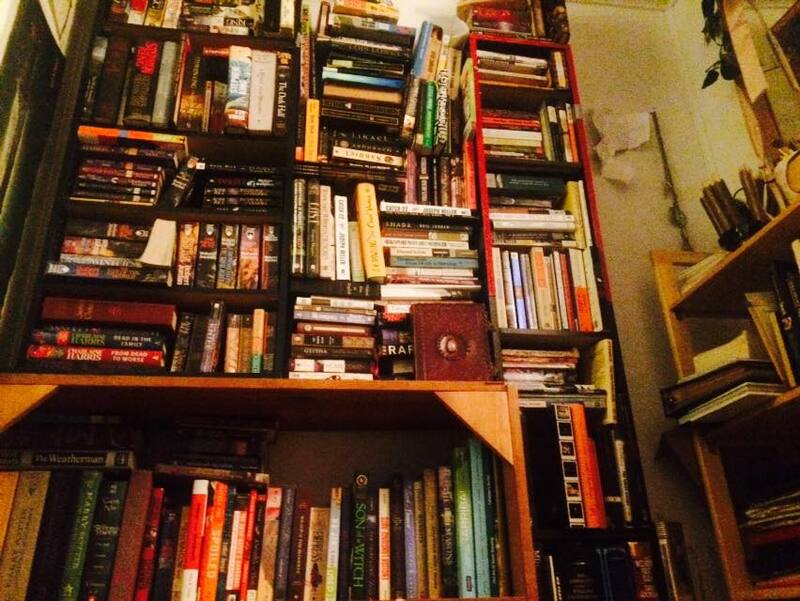 I have four book shelves and one pile. Although I would sooner give away a book than I would my journal, they are nonetheless, very close to me. Like the journals I have, they tell a story of age and transformation through my tastes and what I’ve retained. As you can tell I went through a big fantasy phase, but I’ve never stopped loving the horror and psychological suspense that a Stephen King book offers, On Writing has recently been given away as a birthday gift to my cousin who I know will make the most of it. My favorite gift to give is a book; this is often most people’s least favorite to receive. In the same way that I can recall where and when I received a book, I know where, and to who they’re going to be with next. Last week I gave away my copy of Phillip Pullman’s The Golden Compass at a baby shower where children’s books were asked to be brought in lieu of cards. It was one of my favorite books as a pre-teen and I remember the day I got it very clearly. I was reading underneath my desk one day during social studies class, like I always did, and my teacher approached me afterwards. I had a hard time connecting with teachers when I was younger, but this one in particular seemed to understand me. Instead of reprimanding, or calling my mother, he came up to me and handed me a copy of this particular novel and said, “If you like that, you’re going to love this.” It was a defining moment. Never before did an adult take an interest in my tastes or connect with me on my own level, and it was through a book. I was touched, and he was right, I did love it. When I think about why I want to be a teacher I think about this moment. You cannot hide from the truth, because the truth is all there is. How do you rewrite a story that’s already been told? Moreover, who am I to take it upon myself to sift through these words, to explain them in any other way than they are already laid out? Everything my Nana has written is fact; these letters were (and still are) a record of her experiences, and unlike movies, books, or lectures, nothing about those experiences was omitted. What then can I, having not even been alive for WWII and the American Occupation, offer to this incredible perspective? I know that these letters have been passed over as my responsibility for a purpose, but my biggest difficulty in confronting them has been deciding what I must do to honor that obligation. Initially I thought I would be able to simply cut and paste the pieces of my great-grandmothers story that seemed the most interesting; I was planning on whittling it down to the most historically poignant of comments and then doing research into specific places and people that she mentioned. I figured if nothing else, I could tell an interesting story about the American liberation of Germany and pull upon my family’s experience as textual support; I thought it would be simple, black and white, just like her cursive script against the page. How completely ignorant I was. Karl Brandt (standing, middle) was one of 23 defendants in the first trial at Nuremberg (aptly nicknamed the Doctors’ Trial because 20/23 defendants were medical doctors being accused of Nazi human experimentation and mass murder under the guise of euthanasia).The indictment was filed on October 25, 1946; the trial lasted from December 9 that year until August 20, 1947. Of the 23 defendants, seven were acquitted and seven received death sentences; the remainder received prison sentences ranging from 10 years to life imprisonment. Keeping Karl Brandt and the other 22 defendants alive for the duration of the trial was my great-grandfather’s direct responsibility. With every day I spent poring over this stack of letters, it became more and more difficult to figure out what I could leave on the page, and what I could take for the blog, for my new story. It felt wrong, to separate even one of her sentences from the one before it, as if I were taking her thoughts and ripping them into awkward, incoherent pieces. What I was unraveling here was an overwhelming number of truths that I was not prepared for; the truth that the luxurious lives of U.S. Army Generals bore an eerie resemblance to those of the Nazi’s before their demise, the truth that racism was alive and well even at the center of a culture claiming to liberate Europe from the dangers of prejudice, and the truth that my great grandparents were participants at this pivotal moment in history. I felt as if I had discovered a twisted treasure, a manila envelope full of tainted gold; these words were so abrasive and so honest that to share them would be dangerous…but at the same time they were so important that to hide them seemed implausible. After days of simmering in self-loathing, pacing my apartment and weighing the morality of each option (do I hide her truth or do I expose it? ), I decided I needed to share my Nana’s letters, blaming my duty of inheritance. I called my mom and we discussed a publication. I was immediately shut down. “There are family legalities that you just cannot mess with, Cait. It’s not ours to publish.” Hearing that was discouraging, I will admit. After days of committing to this idea, I was back at the beginning. I still do not know how I will tell my great-grandmother’s story appropriately. I’m unfortunately not satisfied with summarizing it in a few blog posts, and I am certainly not satisfied with my mother’s reaction, but I honestly don’t know what comes next. 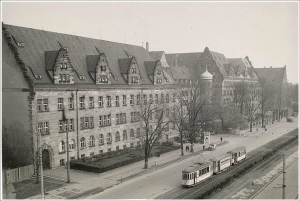 The Palace of Justice, Nuremberg, 1946. 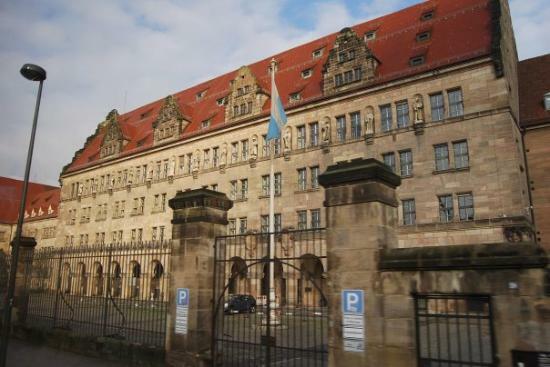 This is where the Nuremberg Trials were carried out and where Red spent most of his time with the prisoners. For now I will immerse myself in the process, get to know my ancestors more deeply, and perhaps even discover my own truth along the way. I’m switching gears for this weeks blog post as I was hesitant to get super meta about the habitus of the ring I’ve been writing about that always lives on my hand and how I am its habitus or something along those lines. It could be an interesting way to approach the topic but I think it’s best for all of us to examine something a bit more tangible. The Towle Sterling Silver Full-Service Set. You can see that it’s a bit worse for wear as it’s been in the family for over 60 years! Instead I’m choosing to focus on a sterling silverware set that is often tucked away in my family home’s red dining room. This is a “full service” set that contains utensils (forks, knives, and spoons) for 12 people as well as serving utensils, such as large spoons for dishes, a meat fork and knife, and a small ladle for sauces and gravies, among other things that somehow get used though I never really know what they’re used for until they’re in use! 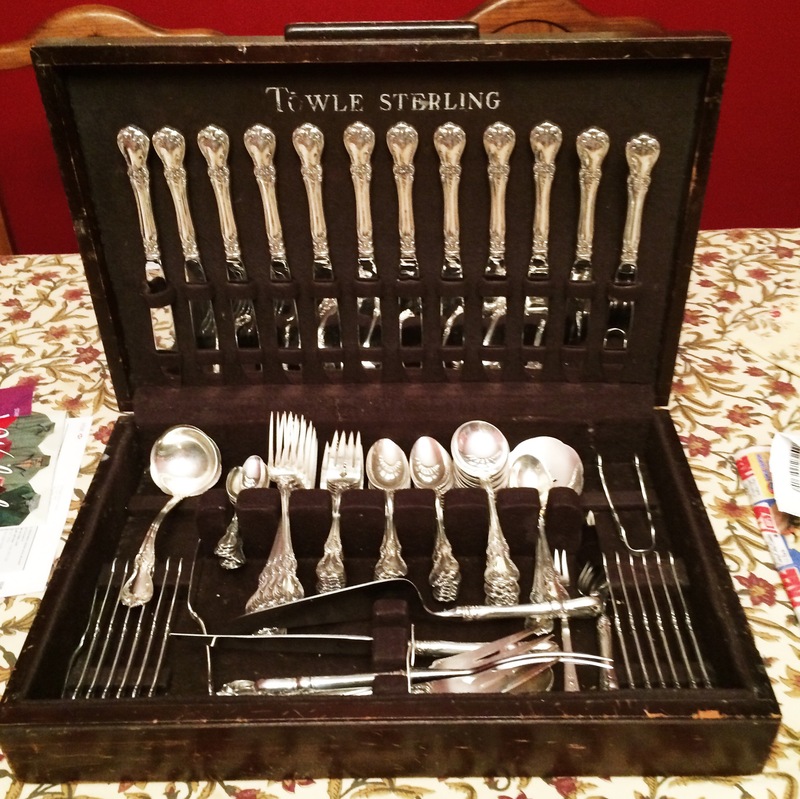 I didn’t realize how special this silverware set was until I started doing some research on the company, Towle Sterling and saw the prices for a set such as this one. Towle Silversmith was founded in 1690 in Massachusetts and has since expanded to become “the proud guardians of America’s silver heritage”, according to their About Us section online. On the website you can browse sets by their style of the hand for the silverware and I selected the one that looks the most similar to the style we own and found out that a 12 piece, full service set costs over $11,000! I was absolutely floored. Now, I have no idea how much our set would be worth now and I had a tough time figuring out the price of sterling silverware like this from 1952. That was the year my grandmother (who gave me the claddagh ring on my 13th birthday), got married to my late grandfather, William Rooney. Colleen Ryan, or Nan as my sisters and I call her, was gifted the set of sterling silver as a very generous wedding gift, possibly from my great aunt Greta who my dad tells me was very wealthy at the time. Nan passed this down to my mother and father when they got married in 1984 and it’s been a part of my immediate family since. The China Cabinet, truly filled to the brim! I’m not sure if the sterling silver set is the reason why we somehow got the role of Christmas dinner hosts over the years but it certainly helps that we have all that fancy utensils! The brown wooden box that houses all the individual pieces only comes out of hiding three times a year. It travels with us to my uncle Paul’s house for Thanksgiving dinner and is used in our own home for Christmas and Easter. These holidays apparently call for the good stuff, so out comes the sterling silver along with the china and the crystal glassware. Objects such as these are a part of a tradition–the occasions that they resurface for seem to require their usage or else would it really be Christmas dinner without the sterling silver? I realize I’ve rambled on a bit about the items and not about their place in a habitus. But that’s what struck me about this sterling silver set. That I almost always forget about the chest that contains the shiny objects until they are called upon when a year has gone by and its time for them to fulfill their dutiful service. It’s a bit sad really–the chest gets filled with the silverware once its been cleaned and polished after use and is closed up and put under our large china cabinet that rests in our dining room. 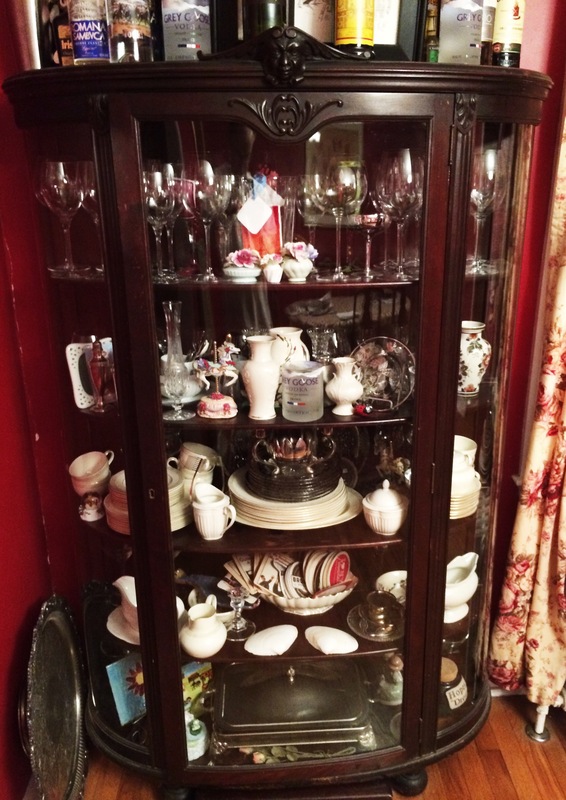 The china cabinet itself is an antique that houses both expensive, delicate items as well as little knickknacks and unique objects my sisters and I have made over the years. The chest doesn’t even have a place within the cherished china cabinet as it doesn’t fit amongst all the other objects that have already been placed within. Under that cabinet that is nearly filled to the brim is the silverware chest that remains their inconspicuous, nearly hidden from sight. I find its existence is our dining room quite humble when I think about it now. Something worth so much and cherished so much lives such a modest life 362 days of the year. It’s nice though, that it’s used for such joyous occasions, when everyone is around the table, eating and drinking and engaging in mirth and merriment. But that too comes to an end and we resume our everyday lives and the wooden chest filled with the sterling silverware is placed gently on the floor and slid under the cabinet, where it quietly rests, destined for a fine layer of dusts until it is to be retrieved again and revealed in all its glory.